Governments have used vouchers to spend billions of dollars on private education; much of this spending has gone to religiously-affiliated schools. We explore the possibility that vouchers could create a financial windfall for religious organizations operating private schools and in doing so impact the spiritual, moral, and social fabric of communities. We use a dataset of Catholic-parish finances from Milwaukee that includes information on both Catholic schools and the parishes that run them. We show that vouchers are now a dominant source of funding for many churches; parishes in our sample running voucher-accepting schools get more revenue from vouchers than from worshipers. We also find that voucher expansion prevents church closures and mergers. Despite these results, we fail to find evidence that vouchers promote religious behavior: voucher expansion causes significant declines in church donations and church spending on noneducational religious purposes. The meteoric growth of vouchers appears to offer financial stability for congregations while at the same time diminishing their religious activities. I have a couple of sharable comments. First, it is neat to see empirical economic research examine how public policy impacts the spiritual or moral sphere of life. No matter your personal religious persuasion, spiritual or moral practices are important aspects of many people’s lives, all over the world. This being the case, social scientists should consider empirically investigating impacts on these sorts of outcomes more often. I say, more often because I suspect empirical studies on spiritual or moral outcomes are sub-optimally produced. One reason for this sub-optimal production is those who have developed empirical skills often don’t consider spiritual or moral outcomes and those who spend most of their time considering spiritual or moral outcomes don’t hold empirical analysis in the highest of regards. This is an issue that my Faith & Economics paper from my fieldwork with churches in Kenya takes head-on. Second, once we all decide to study spiritual or moral impacts more often, we need to figure out how to actually measure spirituality or morals. Indeed this is no small challenge, as these outcomes are often (and perhaps rightly) considered immeasurable and non-quantifiable. Although this may be axiomatically true, empirical studies can approximate spiritual or moral changes in a number of ways. Of course the proxies are not all-encompassing, but they can be suggestive. The authors of this study use closures of church parishes and individual church donations as approximate measures spirituality on the extensive and intensive margins, respectively. This study suggest that these margins may not develop in the same direction. Their key finding is that school voucher expansion prevents church closures (extensive margin) but also reduces church donations (intensive margin). Participation in the voucher program is voluntary for both students and schools. Thus, parishes with high levels of voucher revenue might differ from other parishes for a variety of reasons, including reasons unrelated to voucher spending. Comparisons of parishes with voucher-accepting schools to other parishes could confound the effects of vouchers with these other attributes. To address this fact, we exploit several changes in school choice policies during the period of our sample. These policies altered the maximum voucher payment, expanded voucher eligibility to new communities, and changed the income-eligibility thresholds for some students in some years. We combine this information with detailed address information on each parish to construct a measure of how generous voucher policy is in a given year for a given parish in a given neighborhood. We then exploit the panel nature of our data to follow parishes over time, comparing financial outcomes for parishes seeing significant changes in voucher policy relative to other parishes. Further, we can make this comparison among parishes with schools as well as among those without. We find that expansion in voucher policy is, unsurprisingly, associated with increases in voucher revenues for parishes with schools. 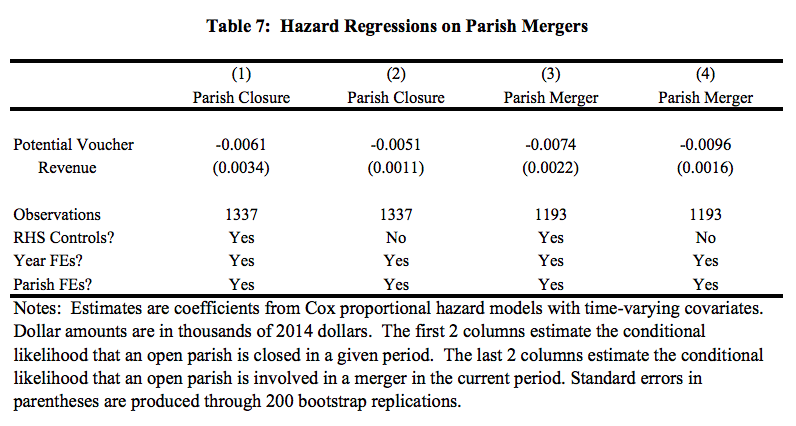 We also find that voucher expansion prevents parish closures and mergers. We document this result using hazard regressions, but it is suggested by simple inspection of the data: closures are reasonably common before the first major voucher expansion 3 we study and stop almost entirely thereafter. We further see how voucher expansion impacts parishes’ finances. 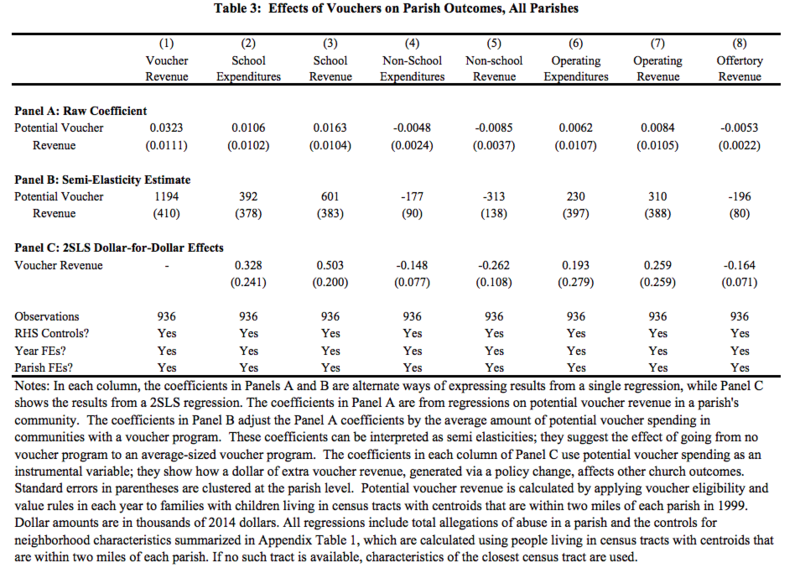 Interestingly, and the above results notwithstanding, we find no evidence that vouchers subsidize parish religious activity beyond the operation of religious schools. In fact, our estimates repeatedly suggest the opposite. Vouchers cause a significant decrease in spending on non-school religious purposes such as religious staff salaries, mission support, and church maintenance. We also find that voucher programs lead to a significant decrease in church donations. These results are driven by parishes with schools and are robust to a battery of tests. These effects are large in magnitude. Our results suggest that if voucher eligibility in a parish’s community increased from no eligibility to the level of eligibility in the average program, noneducational religious expenditures (that is, expenditures on activities other than running a school) would decline by about $175,000 and non-educational revenue would decrease by even more, about $300,000. Put differently, our numbers suggest that, within our sample alone, the Milwaukee voucher program has led over time to a decline in non-educational church revenue of $60 million. These large effects are driven by the large size of the voucher program itself. While the extensive- and intensive-margin stories work in opposite directions, the intensive margin effects we identify are net effects that subsume the effect of vouchers on closures. That is, the overall impact of vouchers on religious revenues and expenditures is negative. Why does this matter? I heard a pastor say once that giving (through tithes and offering) is a spiritual muscle that needs to be exercised. Without repeated giving, the muscle becomes weak and feeble. So, this is some evidence that (among Catholic churches in Milwaukee, WI) the expansion of school vouchers is guilty of causing a reduction in the spiritual practice of giving. ← Is Poverty in (2/3 of) Africa Mostly Chronic or Transient?